What Are The Best Online Graduate Certificate in Nursing Programs? What Do I Need to Get Into an Online Graduate Certificate in Nursing Program? What Will I Learn in an Online Graduate Certificate in Nursing Program? What Can I Do With a Certificate in Nursing? The nursing field offers numerous advancement opportunities. According to the Bureau of Labor Statistics, the healthcare industry has the highest projected growth of all occupations, with an estimated 9.8 million new healthcare jobs from 2014 to 2024. A graduate certificate for RNs helps students sharpen existing skills and learn new approaches to healthcare and training. Requiring only two semesters of study, an online graduate certificate in nursing will help you achieve your professional goals. GWU in Washington, D.C., offers six different online graduate certificates in nursing, including a graduate certificate for RNs in nursing education. The program was designed for nursing professionals who work full-time. Students complete four online classes over the course of one year, including classes on learner engagement and teaching with technology. The certificate program prepares students to sit for the nurse educator certification exam administered by the National League of Nursing. This particular program does not require any clinical work, which means students can complete all courses online. To be admitted, applicants must possess a current RN license and a bachelor of science in nursing with a minimum GPA of 3.0. GWU also offers certificates in five other programmatic areas: adult-gerontology acute care; adult-gerontology primary care; family nursing; health policy and media engagement; and psychiatric mental health. The online nursing program a George Mason allows students to complete a part-time program that fits into their own busy schedules. The online graduate certificate in nursing prepares students to teach at hospitals, community healthcare agencies, and schools of nursing. The program consists of 15 credits, and most courses combine asynchronous, online learning with face-to-face collaboration. Two of the courses — part one and two of the practicum — require 90 hours of onsite work at a clinical facility. To fulfill clinical hours, students who do not live near George Mason need to make arrangements at healthcare facilities near their homes. The school's certificate program only accepts students who have completed or are enrolled in an MSN or PhD in nursing program. To apply, interested students must possess a minimum 3.0 GPA in their graduate programs. The school considers applications for the fall semester only. UConn offers an online graduate certificate in nursing that focuses on healing and integrative medicine. The nine-credit graduate program in holistic nursing consists of three courses that can be completed in one year. Courses explore how to apply holistic-based research to address issues in health services, policy, and practices. Students who complete the program have the educational foundation needed to pass the national board certification test in holistic nursing. Students are expected to complete a practicum project that is designed in collaboration with faculty. The university is based out of Mansfield, Connecticut, but students from any state can complete the program online. To be admitted, applicants must have earned a minimum undergraduate GPA of 3.0. Prospective students do not need to submit GRE scores. Nursing professionals who are interested in assisting with surgeries should consider the University of Tennessee's registered first nurse assistant program. The course certifies students to become surgical first assistants who work directly with surgeons to achieve optimal patient outcomes. Students enroll in two online courses and one clinical practicum, totaling nine credits. Courses in the online graduate certificate in nursing cover topics such as surgical procedures, instruments, and safety measures. As part of the program, students must participate in 40 hours of on-campus simulation workshops. The registered first nurse assistant role is recognized in all 50 states. However, nurses without advanced practice nursing (APN) licensure or a master's degree must reside in Tennessee, Mississippi, or Arkansas to enroll in the program. Nurses with APN licensure who live outside that tri-state area should check with the Office of Student Affairs about enrollment eligibility. To be admitted, applicants must already be registered nurses, and they must have earned a minimum undergraduate GPA of 3.0. Nursing professionals who hold licensure in the U.S. or any other country can enroll in Penn State's nurse administrator graduate certificate program. The nine-credit program requires students to complete three courses covering topics such as healthcare economics and policy, leadership theory, and workforce issues for nurse administrators. Students can also opt to take a four-credit synthesis course, which allows them to practice their newly-learned skills in real healthcare settings. To apply for the online graduate certificate in nursing, interested professionals must have earned a bachelor's degree with a minimum GPA of 3.0. Students are not required to take the GRE, but if they have already finished or are currently enrolled in a graduate program, they must have earned at least a 3.3 GPA in their graduate coursework. While foreign students can enroll in Penn State's program, their previous degrees must be deemed comparable to those offered by regionally-accredited U.S. institutions. Nursing professionals can choose from six different online graduate certificates in nursing at the University of Kansas. The certificates are offered in five programmatic areas: adult/gerontological nursing, nurse midwifery, psychiatric/mental health, health education, and healthcare informatics. To be admitted, applicants must have completed coursework in health promotion, advanced pharmacology, advanced health assessment, and advanced pathophysiology. Students must complete 12 to 25 credit hours depending on the certificate chosen. Applicants must have already earned a master's degree with a 3.0 GPA. All certificate programs require applicants to have a registered nurse licensure in at least one U.S. state. The psychiatric/mental health nursing certification program is offered only every other year. Florida-based nursing professionals interested in teaching their skills in schools or healthcare facilities should consider enrolling in a FIU's nursing education graduate certificate program. Courses in the program cover areas such as curriculum development in nursing, adult teaching methods, and clinical teaching strategies. The program also teaches students to guide classroom learning, utilize teaching technologies, and provide competent care across cultures. The online graduate certificate in nursing consists of 17 credits that can be completed in one year. Interested professionals must possess a master's in nursing or be enrolled in a nursing master's program. Applicants must also possess a registered nursing license in Florida. WSU offers online graduate certificates in nursing in several programmatic areas: nursing and organizational leadership, adult-gerontology acute care, adult-gerontology clinical nursing, nursing education, family nursing, and psychiatric-mental health. Each certificate consists of between 12 to 24 credit hours and takes one semester to two years to complete. The nursing and organizational leadership certificate program consists of the most demanding curriculum. Students must complete 24 credit hours, or eight classes, over the course of two years. Two of those classes are practicum courses that require a total of 360 clinical hours. For all graduate certificate programs in nursing, students must possess or be pursuing a master's degree. WSU also recommends that interested students have one year of clinical nursing experience. UAH offers a graduate certificate for RNs who are interested in nursing education. Students in the program must already possess or be pursuing a master's degree. Courses cover topics such as curriculum development in nursing, testing and evaluation in nursing, and teaching strategies. The 18-credit program is designed to accommodate students who are full-time professionals or graduate students. It includes six online courses that students can complete in one year. Graduates can go on to teach in a variety of settings, including community colleges, baccalaureate programs, and clinical educational programs. They are also prepared to take the certification exam in teaching offered by the National League of Nursing. Applicants must submit college transcripts, but essays and recommendation letters are not required. Registered nurses interested in teaching can earn an online graduate certificate in nursing education at JSU in Alabama. The program consists of four classes that cover the development of educational programs, teaching and evaluation, and issues and trends in nursing education. Graduates of the program gain valuable skills in clinical instruction that can be applied to learning environments in both academic and professional settings. The coursework includes a practicum requirement that can be designed according to a student's needs. Aside from the practicum, all courses are offered online, which is ideal for students who work full-time. Applicants must have already earned a bachelor's degree in nursing from a regionally accredited college or university. They must also possess an unencumbered RN license valid in the United States. Students earning a graduate certificate in nursing refresh skills learned during undergraduate work and learn new skills necessary for occupations in healthcare. Specialized training allows students to pursue new careers in the field. For example, a registered nurse working in a clinical setting may pursue a graduate certificate in nursing education, which opens career opportunities teaching in schools or leading professional workshops. A graduate certificate also allows nurses to move into managerial or administrative roles. A variety of nursing concentrations, such as clinical research management and healthcare informatics, prepare nurses for specialized occupations in the healthcare industry. Applicants to a graduate certificate in nursing program should hold bachelor's degree in nursing from an accredited university and have at least a 3.0 GPA. Most graduate certificate programs require applicants to have unencumbered RN licensure. While curricula vary by school and concentration, the following courses are common to most online graduate certificate in nursing programs. Each course teaches skills applicable to a variety of nursing professions. A student's concentration influences curriculum requirements; students may focus on administrative, educational, or clinical training. Curriculum development in nursing: A common course for those in the nurse educator track, this course teaches students how to design a nursing curriculum and assess student learning. This training prepares students for roles as clinical trainers and community educators. Chronic disease management: This course familiarizes students with interdisciplinary care approaches for people with chronic and life-limiting illnesses. Students learn to assess the needs of patients and their families. This course prepares students for careers as chronic disease outreach coordinators and chronic care managers. Healthcare policy, politics, and economics: This course examines the impact of healthcare policies on nursing practices. With an emphasis on patient safety, coursework prepares students for careers as nurse administrators and public health clinicians. Holistic nursing: This course covers concepts of holistic nursing, including health and wellness, spirituality, and the mind-body connection. Students gain skills in integrative practices and team collaboration. The course examines contemporary views of holistic nursing and prepares students for careers as botanic therapists and integrated health specialists. An online graduate certificate in nursing prepares students for careers in areas such as clinical practice and community advocacy. Depending on a student's concentration, potential occupations include nurse educator, laboratory analyst, and nurse administrator. Hospital nurses often work 12-hour shifts, while school and community nurses typically work traditional business hours. Healthcare professionals are detail-oriented and compassionate, and they possess strong critical thinking, organizational, and communication skills. These healthcare professionals assess the health needs of individuals and groups. They provide training programs for public service workers and advocate for improved healthcare. Nurses with training in healthcare informatics operate laboratory equipment used to analyze blood, urine, and tissue. They discuss findings with physicians and supervise medical laboratory technicians. These healthcare professionals manage facility finances, recruitment and training of clinical and office staff, and budget development. They identify and implement goals to improve healthcare delivery. Nurse educators employed by community colleges and universities teach nursing courses, develop syllabi, and plan lessons. Postsecondary teachers advise students, collaborate with colleagues, and conduct research. Registered nurses may specialize in areas such as critical care or neonatology. They conduct intake assessments, administer medication and treatments, and operate medical equipment. Choosing an accredited online graduate certificate in nursing program ensures the program adheres to rigorous academic standards. The two most common types of accreditation in the U.S. are regional and national accreditation. Regional accreditation is awarded by six regional accrediting agencies and is the most common and highly regarded form of accreditation. Nationally accredited colleges tend to cost less, but most regionally accredited programs do not accept credits earned from nationally accredited schools. Online students should look for programs accredited by the Distance Education Accrediting Commission, which specializes in distance education. 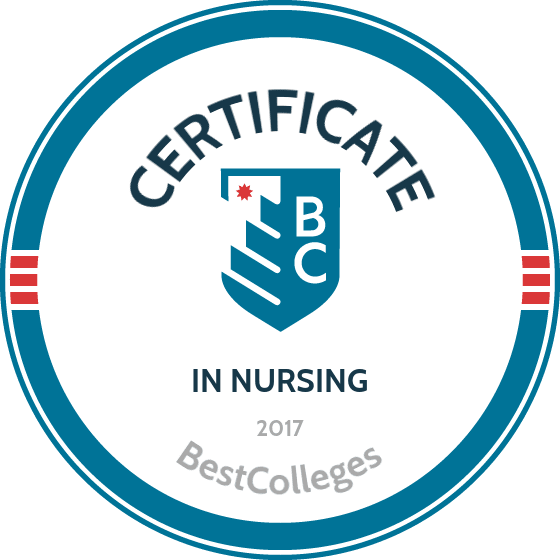 Nursing-specific accrediting organizations include the Accreditation Commission for Education in Nursing and the National League for Nursing. These organizations promote improvements in healthcare delivery by implementing training standards that emphasize integrity and diversity. Numerous resources are available to finance a graduate certificate in nursing. The most desirable forms of financial assistance are scholarships and grants, which do not require repayment. Nursing scholarships support students interested in areas such as gerontology and neuroscience. Students should complete the Free Application for Federal Student Aid, or FAFSA, to determine their eligibility for federal assistance programs, including low-interest loans and work-study programs.